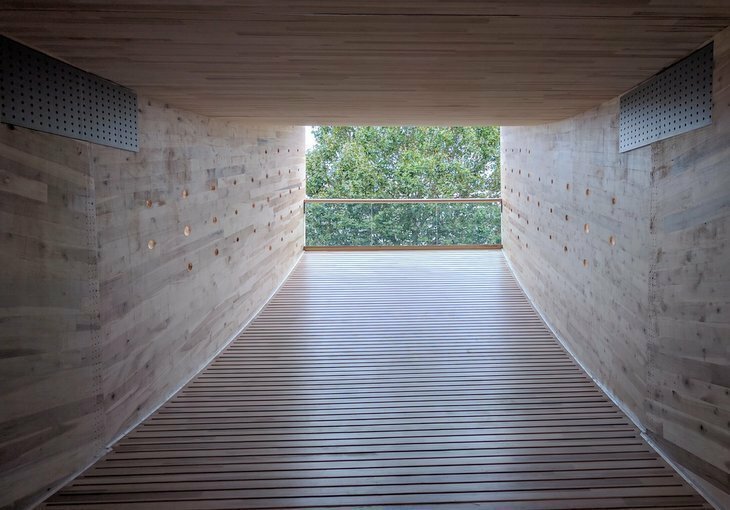 Step inside a giant wooden smile. We've already brought you our thoughts on the fantastic London Design Biennale and the news of mini jungles near Old Street. London Design Festival kicked off properly this weekend, and we're sharing some of our favourite bits. 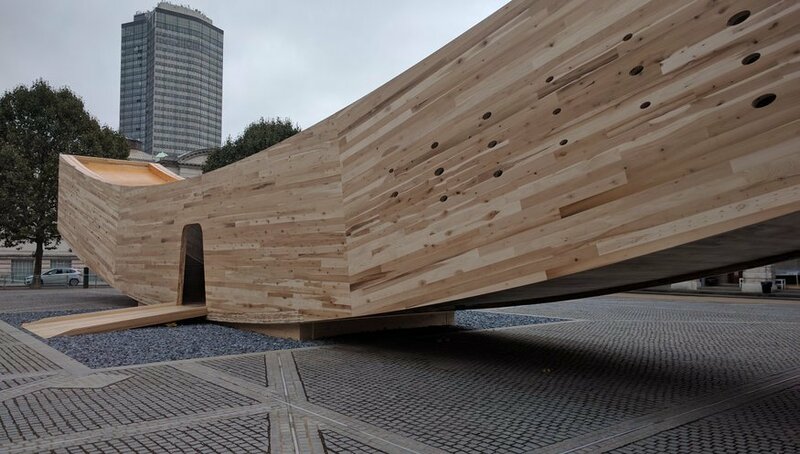 In the square outside Chelsea College of Arts, and across the road from Tate Modern, is a giant wooden 'smile' by Alison Brooks' Architects. Visitors can walk inside and up the curved sides. The design is beautiful in its simplicity and the way natural light flows in. Exploring it definitely made us smile. The view inside The smile. The V&A is the major base for the festival and its installations don't disappoint. 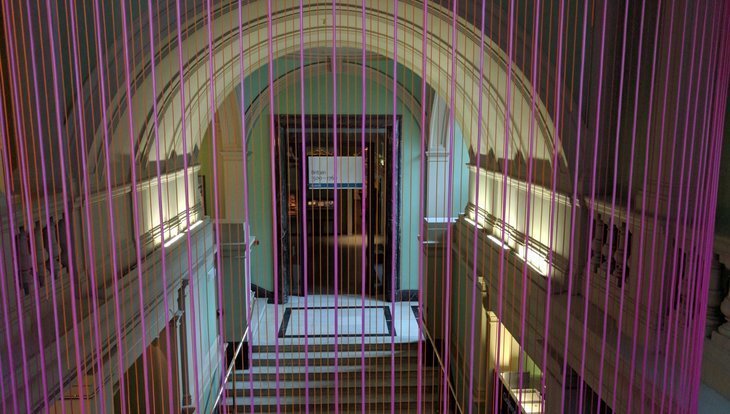 A giant multi-coloured circular curtain of strings descends from the ceiling six floors up. Stick around a while and it will slowly move once a minute, letting us know that it's a giant, albeit unorthodox, clock. Upstairs is a piece of marble which is designed to resemble waves. The precision engineering behind it makes it look remarkably like a liquid, an effect that can only be rumbled by getting very close to it. The magnum opus is saved for the Tapestry Room. 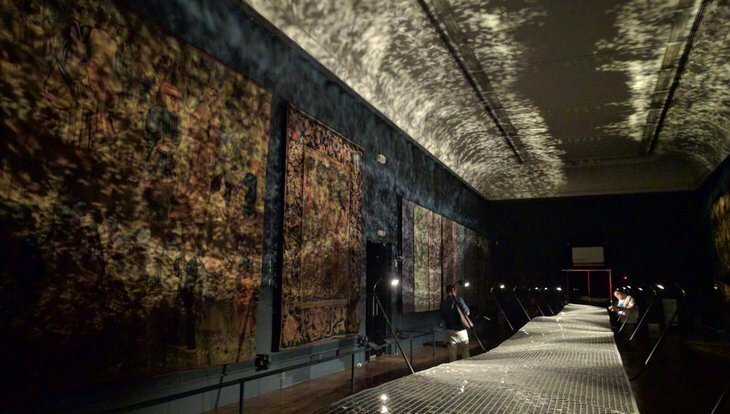 Lights shine onto hundreds of mirrors that are slowly moving, creating a dappled pattern across the walls and ceilings of the gallery. It's hypnotic, and images can't do justice to how spectacular it is. The fantastic Foil by Braun in the V&A Tapestry Gallery is hypnotic. If you're at the V&A, make sure you pop across the road to Plinth, a pop-up store that crosses art with design, selling items such as blankets and plates designed by major artists. The entrance has been converted into a mini garden which both adults and children will love. 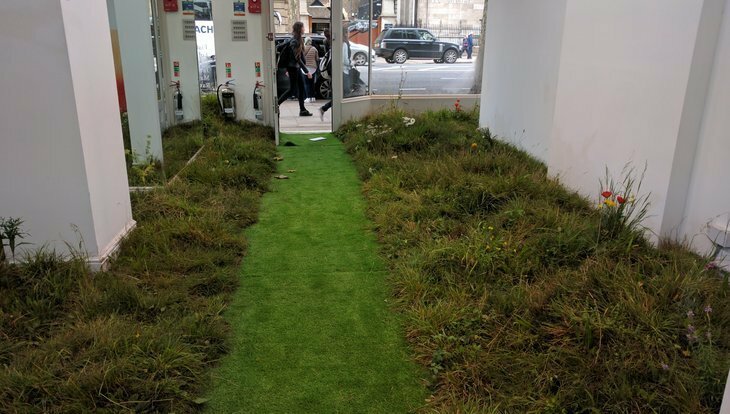 The grassy entrance to the Plinth pop-up store. Over at Habitat on King's Road, the top floor hosts an exhibition, put on by the Crafts Council, that's perfect for children (and the inner child in all of us). Artworks, which have to be operated by visitors, include a mechanical hand that drums its pedestal, and a sand timer that triggers a gong. The works range from an absurd and long-winded design to help trigger party poppers, right through to Tim Lewis' self-referential donkey which draws a self portrait when operated. This love story told through dioramas is narrated by Stephen Fry. 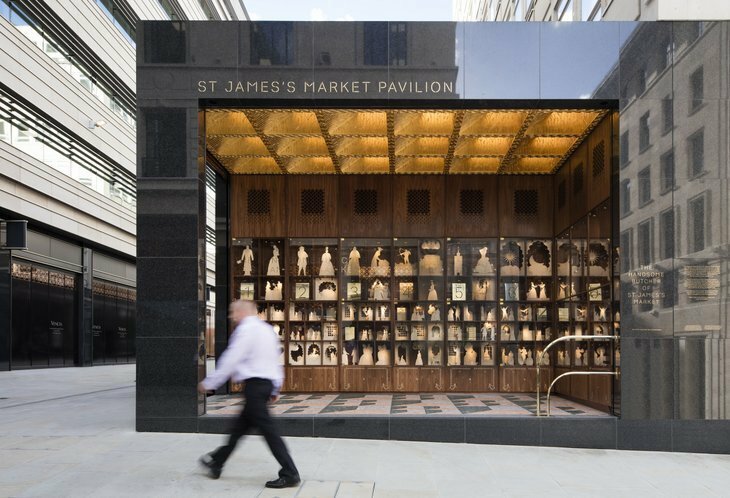 St. James's Market has a visually stunning display of wooden figures acting out a story called The Handsome Butcher of St James's Market. Hearing Stephen Fry narrate it is an added bonus. Omer Arbel's illuminating addition to the Barbican foyer. 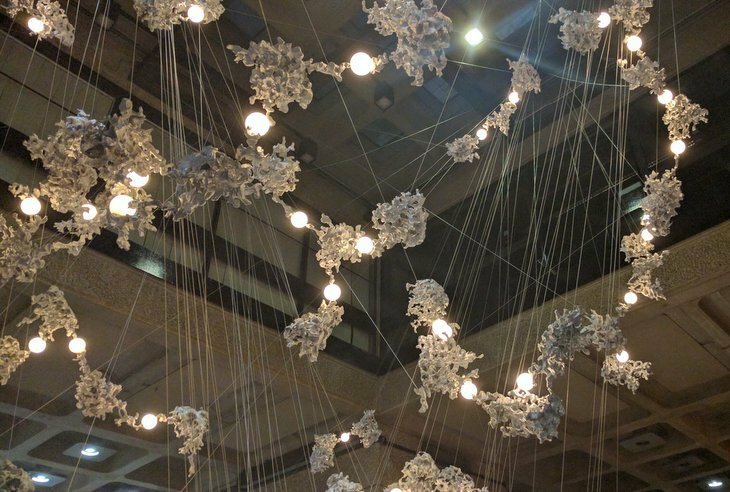 The Barbican gets in on the Design Festival action with an eye-catching light installation by Omer Arbel suspended in the foyer. This year's festival feels bigger and better than ever. Our highlights only scratch the surface of the festival's full programme of talks, exhibitions, shops and architecture. London Design Festival runs from 17-25 September, with some of the programme extending beyond these dates. Most things are free and it's best to check the programme for opening times and dates.